Istanbul, a city that pulls you in with its east-meets-west vibe, a skyline dotted with minarets and Byzantine church spires where chic rooftop bars lie close to the golden dome of the Hagia Sophia. Everywhere you turn there’s something to see, something to admire and most definitely something to remember. The nine-storey Galata Tower’s vantage point is undisputed, seeing as it was built by the Genoese in 1348 and used as an observation tower to spot fires by the Ottomans. For a breathtaking view of Istanbul’s skyline go at sunset but be prepared to stand in line as there’s often a queue of people waiting to enter. Istanbul has a number of restaurants and bars that boast a sky-high perch looking out to the shimmering Bosphorus but Mikla Rooftop Bar has a distinct advantage, its chic outdoor terrace – that’s heated in the winter months – with a wraparound view of the city. Add in the menu of modern, Turkish cuisine that’s earned it a no.44 spot on the World's 50 Best Restaurant list, making it a spot for more than just sunset cocktails. Few cafes will offer as good a setting as the House Café in Ortakoy. Its patio seats look out directly on the Bosphorus Bridge and the sublime Ortakoy Mosque. Head here before or after a visit to the mosque or make plans to drink in the view over a leisurely brunch. Visit this famous Istanbul landmark by boat from Uskudar on the Asian side. In existence since the medieval Byzantine period, legend has it that a Sultan put his daughter in the tower to protect her from a prophecy that had predicted her death. 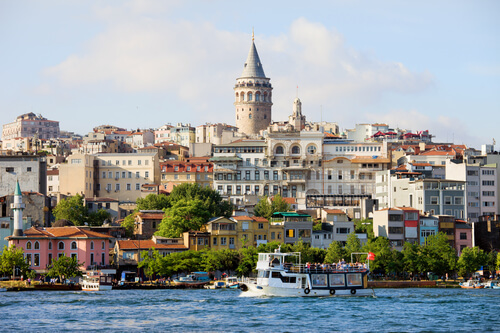 These days, the tower pulls in visitors for being right on the famed Bosphorus, and if it looks a little familiar, it was featured in two James Bond films, The World is Not Enough and From Russia With Love. The palatial surroundings of the Ciragan Palace Kempinski counts as a must-see spot in Istanbul. Once known as the Kazancioglu Gardens, this historic 17th century structure was home to seven sultans and continues to host guests like Madonna, Oprah Winfrey and a number of presidents on a regular basis. If the opportunity to stay there crops up, do so and be sure to have a dip in its heated pool that looks out across the Bosphorus and towards the Asian side of Istanbul. Otherwise, make a reservation at Tugra and enjoy a divine Turkish meal inspired by traditional Ottoman recipes. The on-site café has existed since the 18th century – this is reason alone to visit. 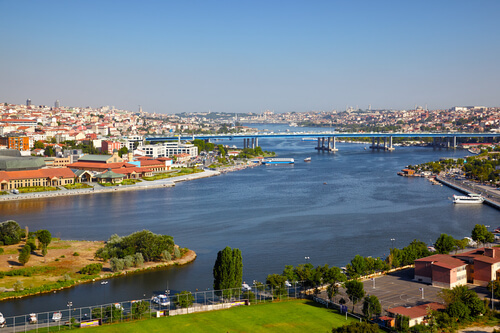 That it overlooks the expansive Golden Horn from an elevated vantage point and reachable via walking up a hill or riding a cable car just adds to the experience. Go for the view but linger on to explore the numerous historical buildings including a double epigraphy, wooden Kasgari Tekkesi (religious establishment belonging to Sufis) dating back to 1813. The numerous views from the sprawling Topkapi Palace owes much to its location on Seraglio Point overlooking the Golden Horn, Istanbul’s ancient harbour. While it’ll take more than a day to explore the historic palace that was built in 1478 by Sultan Mehmed the Conqueror, don’t leave without dropping by the Konyali Lokantasi restaurant where the terrace seating looks out to the Bosphorus in the direction of Russia. Set in a 1920s mansion – known as Atli Kosk (or Horse Mansion) – that was once the residence of an Egyptian prince, this private museum dedicated to calligraphic art and paintings of the Ottoman era is worth traveling to. Situated in the wealthy Emirgan neighbourhood, the mansion’s lush garden and terrace has a view looking towards the Anatolian side of Istanbul. If you happen to find yourself on the Asian side of Istanbul, pay a visit to the Buyuk Camlica Tepesi that’s situated 268 m above sea level. Easily reached by bus or taxi, there’s a number of cafes dotted about the park where a cup of Turkish coffee and a snack can be enjoyed along with the sunset.